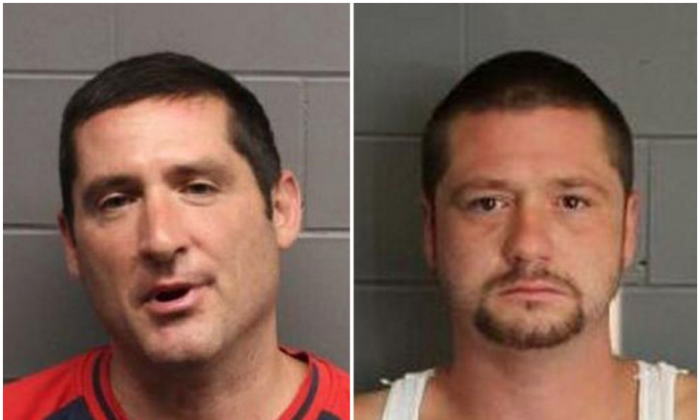 Brothers Scott, 38, and Steve Leader, 30, were accused of beating and urinating on a homeless Mexican man in Boston last August. On Tuesday, both men were sentenced after pleading guilty. When they were arrested a day after the incident, the men told police: “Donald Trump was right, all these illegals need to be deported,” according to prosecutors. A witness recording seeing one of the men take a metal pole and strike the victim with it repeatedly, then the two assailants walked away laughing. The men also threatened police while in custody and believed the attack was justified because the victim was Hispanic and homeless. The victim, Guillermo Rodriguez, was asleep in a subway station at the time. According to court documents, the men attacked him because they felt was an illegal immigrant—but Rodriguez, said in a statement that he is a permanent U.S. resident. The men were charged with causing bodily injury, while committing a civil rights violation, as well as assault and battery for purposes of intimidation causing bodily injury, two counts each of assault and battery, and two counts each of assault and battery with a dangerous weapon. Scott was sentenced to 3 years behind bars, while Steve faces 2 and a half years. Both men will serve 3 years probation after their time in jail, according to a Suffolk County District Attorney’s Office statement.